Jonathan Alder’s Sydney Winslow (top photo) returns the ball during Wednesday’s first singles match at Marysville. Jonathan Alder’s girls tennis squad scored a 4-1 victory over Marysville during a non-conference match on the MHS courts. The lone Monarch victory on Wednesday came at second singles as Caroline Geraghty defeated Maddy Grove 6-4, 2-6, 7-5. Sydney Winslow of JA won the first singles match with a 6-3, 6-2 verdict over Ellie Williams. 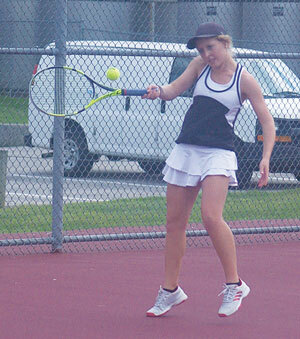 Chloe Sullivan of Alder took the third singles contest with a 6-3, 4-6, 6-2 triumph over Brenna Blackburn. Abigail Watkins and Eliza Watkins of JA won the first doubles match. They defeated Grace Larriuz and Lauren Markert 6-4, 6-2. Mary Kate Hipp and Gabby Pollom downed Marysville’s Maddie Blaisdell and Krista O’Shelfski 3-6, 6-4, 6-4 during the second doubles match. “The match was very competitive with three of them going to three sets,” said Monarch coach Bill Romine.